of old textiles and works of art. regional transport from Berne or Thun to Toffen; postbus from Toffen to Abegg-Stiftung and back according to timetable. daily 2 p.m. - 5.30 p.m. The focus of the new special exhibition at the Abegg Foundation is the luxurious textiles once used for decorating princely residences. The displays include outstanding examples of furnishing textiles, such as the splendid wall coverings used to decorate the apartments of Empress Joséphine of France and Catherine the Great of Russia. 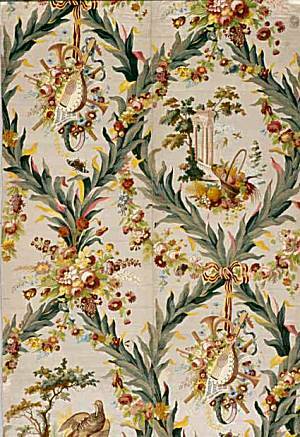 Textiles played a central part in interior decoration during the eighteenth century. They were used for wall coverings, curtains, bed hangings, screens and for upholstering furniture, with the aim of creating harmonious interiors. The exhibition reveals the great variety of materials, techniques and designs used in the textiles of this period. Embroideries, leather wall coverings and painted Chinese silks are on display, along with woven silks and woollen textiles. The highlights of the exhibition include richly patterned silks associated with Europes most powerful ruling houses.